If music makes the world go around, then First Congregational Church is spinning. The FCC Music Ministry is built on a rich tradition of excellence and provides a powerful form of expression that enhances the spiritual journey of everyone in the church. 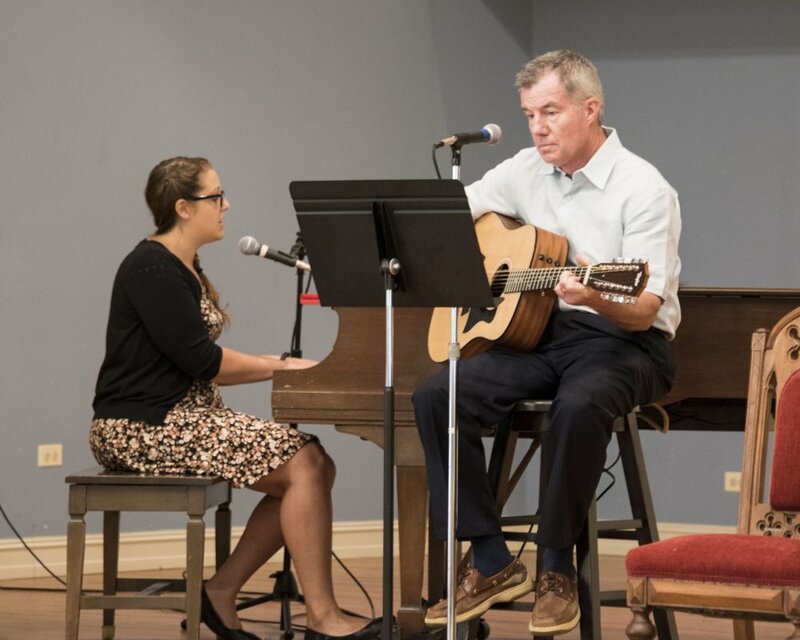 FCC’s Music Ministry offers musical opportunities for all ages from birth to adult. We focus on inspiring spiritual growth through music; building music, ringing and singing skills; and serving our church and greater community with our musical gifts. Join Us: If you have never been in choir before - it’s never too late to start. New members, regular visitors and friends are always welcome to join the choir! In addition to vocal and bell choirs, we also offer opportunities for instrumentalists (click) and have a Birth-6 years old Family Music Class (click). Being in a FCC choir is fun, rewarding and a great place to be. New singers are welcome to join throughout the year. There may be a concert coming up or a cantata that we are preparing for – but we can always find a way to include you! Music reading skills or singing experience is not necessary to join. We just ask that you come with an open heart and participate as much as you can. We can teach you what you need to know. Just contact Ann Tucker for more information – ann@fcc-cl.org. Rehearsals are 8:00-9:30pm Wednesdays, September-May. Sings at the 9:00am service weekly, Good Friday and the 11:00pm Christmas Eve service. Rehearsals are 12:30-1:30pm Sundays, September-May. Sings at 11:00am service weekly and the 8:00pm Christmas Eve service. Performs in annual High School Choir and Bell Choir Spring Tour. All High School students are welcome. Rehearsals are 6:30-7:30pm Wednesdays, September-March. Both choirs will sing together at 11:00am service 4-5 times annually. Presents two cantatas, December and March. All 3rd, 4th, 5th, 6th, 7th and 8th graders are welcome. Rehearsals are 10:15-10:45am Sundays, September-March. Sings in 11:00am worship service 4-5 times annually. All children Kindergarten, 1st and 2nd graders are welcome. Our bell choirs are open to new or inexperienced ringers at the 4th-8th grade level, contact Matt Potts at matt@fcc-cl.org to join. 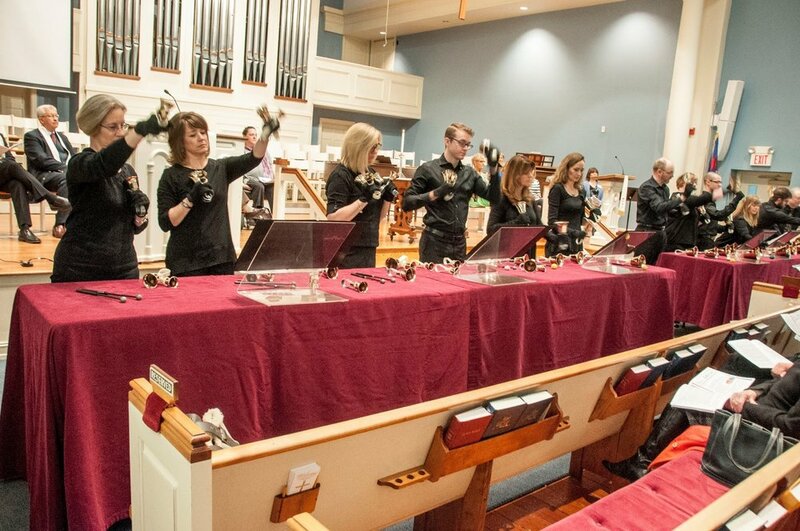 High School and Adult interested ringers should contact Toni Gambini at toni@fcc-cl.org to find out more about participating in the more advanced bell choirs. Rehearsals are 5:00-6:30pm Sundays, September-April. Rings at 11:00am service monthly and the 8:00pm Christmas Eve service. Rehearsals are 12:30-1:30pm Sundays, September-March. Rings in 11:00am worship service once in fall and once in spring. 6th, 7th and 8th graders are welcome. No experience needed. Rings in 9:00am worship service once in spring. 4th and 5th graders are welcome. No experience needed. We believe in providing a strong musical foundation and vibrant, fun community to our youngest children and their families. Families are encouraged to come on Thursday mornings to our Family Music Class for children and their caregiver; siblings are welcome. Please contact ann@fcc-cl.org to find out more. Birth through age 6 with parent or caregiver. Siblings encouraged and welcomed. Contact Ann Tucker at ann@fcc-cl.org, to sign-up, space is limited. Accomplished instrumentalists are always welcome and encouraged to participate in worship, special music in the summer and concerts/performances as needed. Please contact ann@fcc-cl.org to let her know what instrument you play and what your interests are for getting involved. We would love to have you! Cast of the Cantata "And They Names Me Jesus"